But as I gathered my ingredients, my craving changed a bit. Okay, it changed dramatically. I went from drooling over the idea of a creamy, slightly spicy white chicken chili, to climbing up the walls with desire for soup with a rich, tomato & herb broth. With Israeli couscous. For some reason, once I spotted that little bag of Israeli couscous from my last $25 Shopping Cart foray, I knew the couscous just had to be in there. This hunting & gathering within my own kitchen continued until I had a hodgepodge of tasty ingredients simmering gently on the stovetop. My nano-apartment smelled incredible, the aromas of garlic, tomatoes and herbs tickling my nose as I racked my brain to figure out what the hell to call this new soup. About a half hour later, my mom, who was visiting me at the time, peeked into the soup kettle and declared I'd just made minestrone. Really? With Israeli couscous? Is that even allowed? I hopped online and did some quick research, only to find that my mother, as always, was right (*le sigh* Moms are always right, aren't they?). 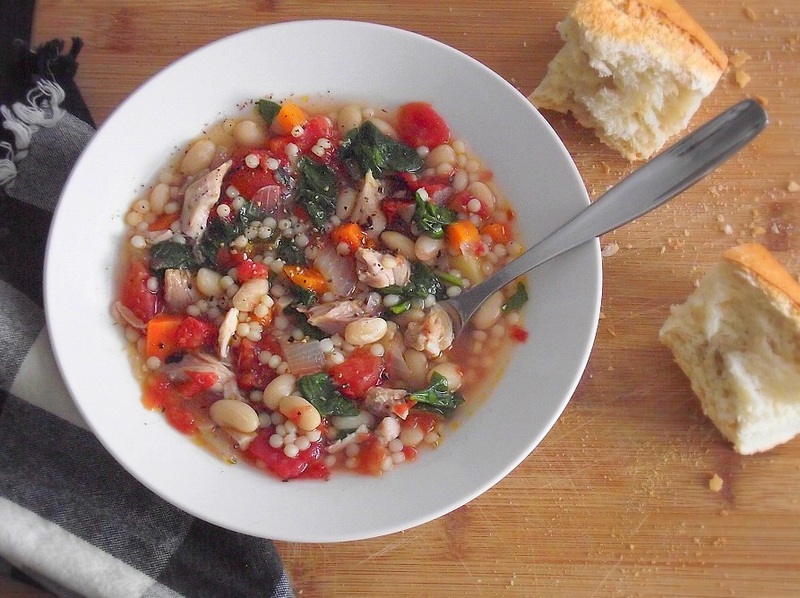 I've eaten plenty of minestrone soup over the years, but I'd never tried my hand at making it. Like some of my other irrational kitchen fears, I always thought it was way out of my league. In my mind, minestrone was some grand, complicated Italian concoction best made by a tiny Italian grandmother who tells crazy stories and feeds you amazing food (sorta like my own Sophia Petrillo). Fortunately, that's not the case. 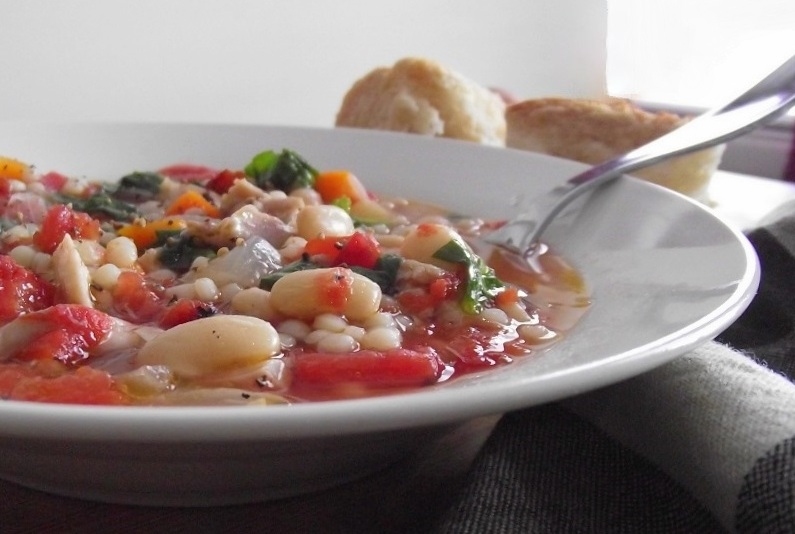 The beauty of minestrone soup is that there's no set recipe to abide by. It's literally one of those everything-but-the-kitchen-sink soups (or sopa de retazos as my mom like to call it). As long as the basic components of broth, pasta, beans, tomatoes & other veggies are there, you pretty much have minestrone. In my accidental version, I used homemade chicken stock and leftover chicken to go along with my veggies and cannellini beans. The addition of Israeli couscous (also known as pearl couscous), is a fun departure from the standard shell or orzo pasta that's traditionally found in most minestrone recipes, and chunks of zucchini and carrots give the soup some nice texture. This is rich & flavorful without being too heavy, and perfect for the cooler weather that's approaching. The best part? This accidental, not-quite-but-still-feels-right minestrone feeds a small army for for less than $1 per serving. How is that even possible? By shopping carefully and making the most of what I already had on hand, even if it wasn't exactly what the standard recipe calls for. Sure, I could have bought shell pasta, swapped out the zucchini for the standard celery, and made other changes to make this more "traditional" (if I'd even known I was making minestrone, lol). But I'd already done my big grocery shopping run for the month, so why buy extra ingredients when I had plenty of stuff that would make a great soup on its own? Shop from your kitchen first and you'll be surprised at how much great food you can make with what you already have. Now, let's check out the recipe! 1. Heat a large soup pot over medium high heat and add the olive oil. Add the garlic, onions, oregano, basil and a dash of salt & pepper. Cook for about 1 minute until fragrant and the onions begin to turn translucent. 2. Next, add the carrots and cook for 2-3 minutes, followed by the chopped zucchini and tomatoes. Cook for another 2 minutes, then add the broth & water. Bring to a low boil, reduce heat to medium and simmer for about 6-7 minutes. 3. Add the chicken and beans and cook for a couple minutes more, followed by the couscous. Simmer for another 5 minutes and remove from heat. Check for seasonings and adjust according to taste with salt & freshly ground black pepper. 4. When ready to serve, stir in the chopped spinach. Ladle generous amounts of soup in bowls or soup mugs and drizzle with extra olive oil. Serve with warm, crusty bread, and enjoy! Isn't the whole point of soup just tossing whatever into broth until it tastes good? That's always been my method! You were intimidated by minestrone but not by ice cream or custard? Wow. I am a soup maven but terrified of doing a custard. I am in awe of your spiced pear ice cream. I hear you about thinking that minestroni should only be made "traditional", but now I too believe your mother is right! I'll bet I can make a pretty good one with just what I have in my pantry now. Gonna give it a shot. LOVE your site! Will be back often. 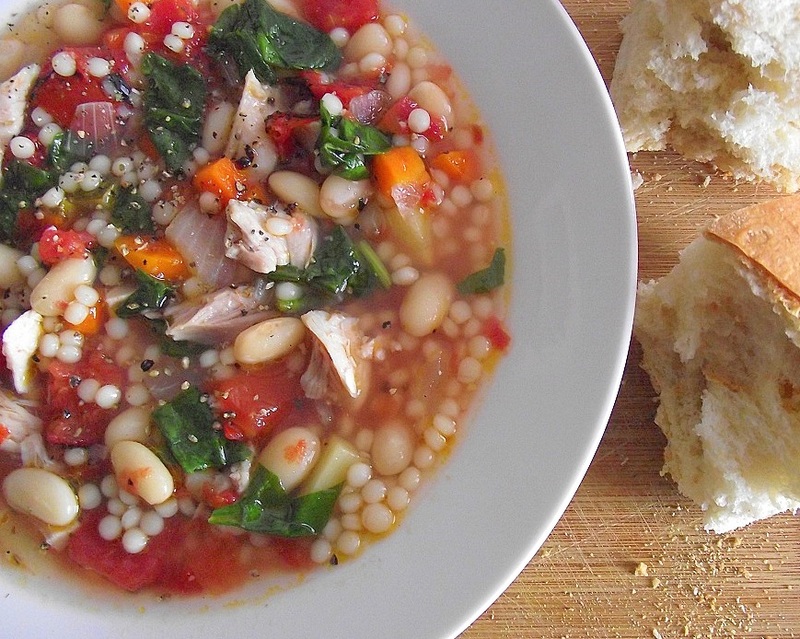 This is unusual but a nice change to traditional minestrone. It looks like you've got lots of protein in there which is more filling than other minestrone recipes I've seen. Thanks. Will try this one. I've made this several times over the past few years. Great recipe!